I noticed that Clover Creek has opened up registration for their online Physics class.There are 2 sections open. Last year, the class filled up very quickly. This seems to be a highly regarded class based on the reviews I've read here. Here's another thread regarding workload and student age that may be of interest. Is RSO Physics I light? Should I supplement? I want to use it next year with my 3rd and 6th graders. My concern is that it might be too light for my science loving 6th grader, but he has requested physics as his primary science topic for the year. His dream is to be a pilot or an aerospace engineer, so he reads about these topics on his own already. Does anyone have any experience with this class or this instructor? https://debrabell.com/product/introduction-chemistry-physics/ We have had excellent experiences with their French classes, but that was because the teacher was super. Anyone taken this before? Thanks! 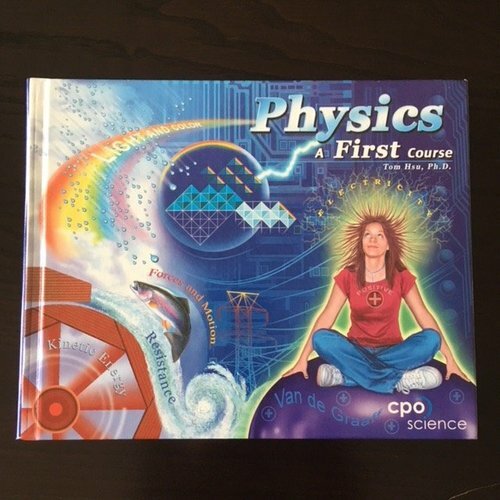 Any advice or tips for purchasing a couple of AP Physics C Exam Review books? When did the exam last change? The Barron's book on Amazon was from Feb 1, 2016, so I was wondering if that was still relevant. DS is not sure if he feels prepared for the E&M portion, but feels much better about the Mechanics exam. Is anyone else taking both? Just one or the other? Would love to hear the Hive's thoughts! Ds just threw me a curve ball and decided that next year instead of the Earth and Life Science that I have mostly all figured out, he wants to do physics. Since the holidays are going to fly buy, and the spring normally has me doing a thousand things at once, I thought I best ask now. I was considering Hewitt's Conceptual Physics, though he will have the math background to handle quite a bit of Algebra based physics. I am assuming that the mathematics in Algebra based would be fairly substantial and the major fixture of the curriculum. That has not really worked out before as Ds is not really looking to stretch himself in science. He is curious, but needs a bit of depth and content to keep him going. I am looking for something like the Apologia Chemistry or GPB Chemistry. Some math, but light and not central to the science. Anyone have experience here? Does the edition of Hewitt matter? We are looking at the college version instead of the high school. Is there something in the high school edition that we really should have that is not in the college edition? Supposedly there are no answers, but you can purchase a practice workbook which contains the odd answers along with extra problems. Is this accurate? For the tenth edition there is Problem Solving in Conceptual Physics for Conceptual Physics appears to be the practice workbook. What is in Practicing Physics for Conceptual Physics? Are there any other programs out there that are not mathematics central that might be better, more interesting, or that I should consider? I'll throw this up on the high school board if needed, but I was wanting to see if anyone here has info for kids who are younger, but really want content. ETA: He will be in sixth grade next year, through Algebra 1 and about half of Geometry. He will also have completed Earth Science and Chemistry. AP Physics C at PA Homeschoolers is on our short list for next year. Has anyone taken it or is taking it this year? How did you like it? Any preference for Jack Kernion versus Jeff Lanctot? Any other AP physics C alternatives? Has anybody taken Areteem advanced math, programming, or physics classes - online or summer camps? Our math club director just sent out an invite to register for Areteem classes this summer. It looks like they offer camps and online courses, and are affiliated with universities like Georgetown University. Reputedly, they help students learn skills to prepare for contests like USA Computing Olympiad. Three of their alumni made of half of the U.S.A. team which won the 2015 International Mathematics Olympiad. Just leafing through their offerings, I was pretty impressed. They offer courses like: Discrete Math, Intro to Algorithms, Python Programming, AP Physics and Physics Olympiad, Math Challenge, etc. Has anyone taken their offerings? I'd be interested in hearing your opinions of their online courses and summer camps. Could this be a good accompaniment to AOPS, perhaps? I'm looking for a physics course (text and/or free online videos like Coursera or MIT/OCW â€“ I'd love to have video "labs," for example) to accompany a precalculus math course (specifically, using Foerster's Precalculus text, which has quite a few physics word problems). Religious content is ok but not assuming a 6000 year earth. From the pinned thread on this board, the texts by Knight College Physics, Giancoli Physics: Principles with Applications, and Singapore Physics Matters seemed like they might work, but I'm open to others; I'm leaning toward Knight (which edition?). I've copied the details, including accompanying problems and videos, from the pinned thread for those three texts in the next post. I don't really know how long it will take to go through the Foerster Precalculus text â€“ it could be a month and a half to a year and a half, so might it be better to wrap up the first high school physics course early and go to a calculus-based physics if the student is very gung ho about the math and physics? Thanks!! I've been scouring posts here on the forum about physics and have been looking at multiple posts from Charlotte Mason, Wildflowers and Marbles, Guest Hollow, Eclectic Homeschooler and several other websites for resources for 1 (ONE) semester of Physics for my 6th grade son. And what I thought originally was a lack of resources, I have now realized is an abundance and I have no idea how to pare it down into one semester. Here are my goals for my 6th grade son: --Give him a desire to learn more on his own --Must be fun and informational but not overwhelming --encourage him to pursue this area life long if that is his desire --I want it to be hands on for him and not exhausting for me :) His visual spatial intelligence was tested off the chart, but he's never studied physics before. He's only in 6th grade, so he can't handle the math involved yet. He will be doing one semester of Chemistry using McHenry's Elements and Carbon Chemistry first then this. Please let me know what you have used and if you loved or hated it or in between and WHY. The resources with asterisks mean that I've heard good reviews. I realize that more is not always better and we live overseas so getting the resources down here is a challenge. But I'm willing to do it if it will be effective for him. And, we are Christians, so keep that in mind. Thank you! So here are the resources I have found: Spines: RS4K Physics Exploration Education* Bite-Size Physicsâ€”by Science Jim* The Wonders of Physics by Irving Adler Apologiaâ€™s Exploring Chemistry and Physics* CK12's Middle School Physical Science CPO Physical Science Tiner's Exploring the World of Physics* Life of Fred Physics Newton and Physics for Kids* Resources: The New Way Things Work (own) (could be used as spine?) Basher Book about Physics (which one?) Asimov's Breakthroughs in Science Backyard Ballistics* Mistakes that Worked (Charlotte Jones) Rube Goldberg Inventions Gismos and Gadgets: Creating Science Contraptions Physics for Every Kid Engineering for Every Kid Machines: Mind Boggling Experiments You can Turn into Science Fair Projects Simple Machines: Starting with Science That Wind at Word Can you feel the Force? The Cartoon Guide to Physics The Physics Coloring Book Michael Faraday: Father of Electronics Usborne Book of Science Simple Machines for Beginners Documentaries: The Way Things Work by Coursera Eureka! Series on Physics topics Mythbustersâ€”Hindenburg Mystery Memory work: The Way Things Work Game Output: Use the Thames and Kosmos set or Exploration Education projects to build what they are studying. Perhaps do an experiment sheet with hypothesis and explaining outcome.. Consider using a Engineering Notebook or 3-Ring Binder to record vocabulary and sketches of projects that have been built as well as in the design phase. Projects: Thames and Cosmos Setâ€”Physics Workshop, Magnetic Science Project Based Engineering Steve Spanglerâ€”Sick Science Fast Physics Kit Geyser Tube with Caps Klutz Book of Paper Airplanes (own) Snap Circuits Electronics Kit or something similar Erector Set Kâ€™Nex Simple Machines Kit (levers and pulleys, gears, wheels, axles and inclined planes Reading: â€¢ Archimedes and the Door of Science (Living History Library) â€¢ Albert Einstein and the Theory of Relativity by Cwiklik â€¢ Isaac Newton: Mastermind of Modern Science by David C. Knight â€¢ Galileo and Experimental Science by Rebecca B. Marcus â€¢ The Boy Who Harnessed the Wind â€¢ What was the Gold rush? , Who was Isaac Newton?, Who was Galileo? Series â€¢ Sky Sailors: True Stories of the Balloon Era â€¢ Mesmerized: How Ben Franklin Solved a Mystery that Baffled All of France â€¢ You Wouldnâ€™t Want to beâ€¦series. A 19th Century Coal Miner in England â€¢ Book on Thomas Edison â€¢ Book on Albert Einstein â€¢ Magic School Bus Books: The Electric Field Trip â€¢ Castles Under Siege â€¢ How do you Lift a Lion I removed the Fred Borst item to put in my Chemistry class for the previous semester. physics Help for my high schooler! Fun Physics for 8yo boy? Hi, My son is very bright but hasn't been interested in science projects or nature study so far. He is fascinated by things like watching a Nova show about the multiverse theory, Brain Games, Myth Busters (although he wasn't very interested in doing the experiments from their book), Fetch... Anyways, last year we did lots of chemistry experiments but I felt like he was just humoring me by doing them and not all that interested. Science should be super fun and absorbing, so I'd like to get it right this year. I asked him if he'd rather mix a couple things together and have them change, or run a light bulb with a lemon and he said the latter. So I was thinking about getting him a physics course with weekly experiments. But now that I'm reading my question I wonder if I should be trying to find him interesting videos about theoretical something? Any suggestions appreciated. This is a fairly new title, but has anyone used or seen feedback on it? I'm looking at it for next year. 3rd and 4th graders. Any feedback or links to other threads appreciated!!! Apologia Young Explorers Chemistry/Physics for 3rd-4th co-op class? I'm thinking of teaching a science course for 3rd and 4th graders at our co-op. Does anyone have experience with Apologia's Young Explorers Chemistry/Physics? Would that be a good fit for this group? Obviously, we could not finish the book in one semester (10 classes, 45 min) but possibly we could continue the 2nd semester. I'm thinking that we would follow the book but do a brief lesson at beginning (10-15 min) and then the remainder would be hands-on activities/experiments. We did do a chemistry (REal Science 4 Kids) pre-level last year, and liked that. But I was thinking this curriculum would expand on that. The other thing I want to ask -- are the materials for the experiments fairly easy to put hands on? We have some basic equipment (graduated cylinders) here. Also I have two classroom kits, one for states of matter and one for polymers which we could use. Would those fit in? Any thoughts and suggestions would be very welcome!